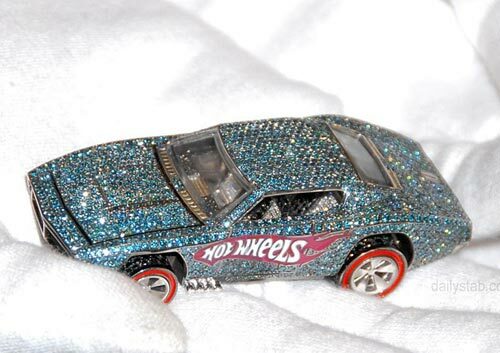 Check out this crazy toy car, encrusted more than 2,700 diamonds. Hot Wheels® today announced its year-long plans to celebrate the brand’s 40-year heritage at the 105th American International Toy Fair®. Anniversary activities were kicked off with the unveiling of a custom jeweled 1:64-scale Hot Wheels® car, designed by celebrity jeweler Jason of Beverly Hills. This one-of-a-kind car, the most expensive in Hot Wheels® history, was made to commemorate the production of the 4 billionth Hot Wheels® vehicle. The diamonds on the custom-made jeweled car, valued at $140,000, total more than 2,700 and weigh nearly 23 carats in total weight. The car is cast in 18-karat white gold with the majority of the vehicle detailed with micro pave-set brilliant blue diamonds, mimicking the Hot Wheels® Spectraflame® blue paint. Under the functional hood, the engine showcases additional micro pave-set white and black diamonds.